BLT for LabVIEW allows you to publish your LabVIEW product installers on the web so it's a lot easier to give access to your programs. 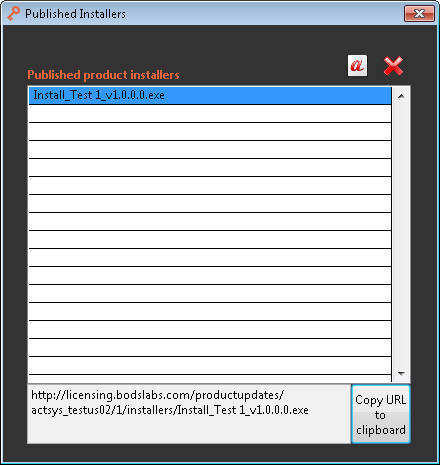 See here how to distribute and publish an installer. Follow these steps to access your published installers, get their URL, change their names and delete them. •Select one or multiple Products in the main dashboard and click on the Published Installers icon. •The following window displays all the installers published online for the selected products. oClick the "Copy URL to clipboard" and give this link to your customers so they can download your product. oUse buttons at the top to Rename or Delete an installer.